Every morning, before the sun rises, our oven is heating up as we shape the masses of dough which in a few hours will be transformed into delicious and crispy croissants, the best in San Miguel since 1998. Among many of the treats we bake is an amazing pain au chocolate. A favorite of our costumers is the Parisian croissant, filled with a smooth almond paste prepared with the best butter. 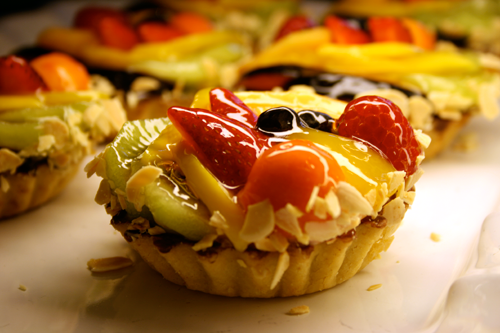 Our danish is topped with a pastry cream and decorated with fresh seasonal fruit. Visit us as we open our doors and you will find a great variety of freshly baked croissants, sandwiches, french baguettes, etc. Please don't leave without trying some of our delicious chocolate truffles with Mezcal or a traditional French macaroon in a variety of flavors. If you are in the mood for something out of this world then make sure you try an éclair au chocolat or one of the mixed fresh fruit tartlets. The first one is a baguette with mozzarella cheese, fresh tomato, basil and olive oil. The second one is black rye bread with Serrano ham, gouda cheese, lettuce and a touch organic mustard. The third one is a ciabatta with the best turkey breast, sliced fresh tomatoes and goat cheese made in San Miguel from the organic farm Remo's. These sandwiches are available daily and can also be ordered for events like meetings or a party. We can also make a smaller sandwich, which makes a delicious snack. Cookies are also a speciality of El Petit Four. They have a variety of them.